Silver Nanoparticles Market size was valued at over USD 1.3 billion in 2017 and is anticipated to grow at over 12% in the forecast timespan. 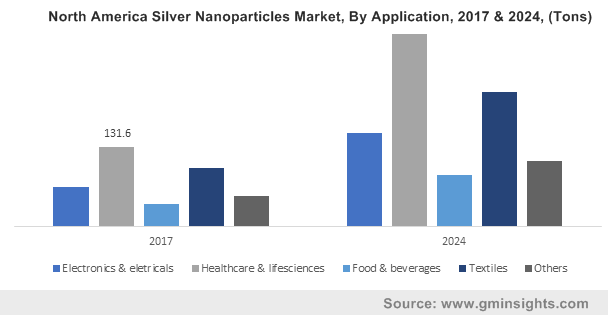 Strong outlook in food & beverage, healthcare & lifesciences, electronics & IT, and textiles industry will propel the silver nanoparticles market growth. The material is increasingly gaining popularity in food packaging, wound healing, coating for medical equipment, LED lights, sensors, solar cells, and textiles sterilization. High potential owing to its effective optical, conductive, and antibacterial properties will drive the demand. Rising adoption in conductive coatings, molecular sensing, and plasmonic antennas will enhance the product penetration. Silver nanoparticles’ antibacterial properties are opening new avenues in healthcare & lifesciences sector. Necessity to extend packaged foods shelf life will remain a key factor to propel demand in food packaging industry. Additionally, improved food quality and safety with respect to the material’s antimicrobial properties will support the industry growth. The product is also gaining attention in silver nanoparticle inks due to growing requirement for printed flexible electronics will fuel the silver nanoparticles market size. Moreover, the catalytic redox properties leading to increased product usage in catalysis. Technological advancements and product innovations will improve the product adoption rate. Increasing R&D investments pertaining to commercialize material usage in cancer diagnosis and treatment leading towards industry expansion. Silver nanowires utilization in nanocomposites due to its increased dielectric constant will create opportunities in the silver nanoparticles market. Offering conductive coatings for flexible electronics and transparent conductors along with enhanced efficiency will boost its adoption in solar cells. Significant government approvals on nanoparticles commercialization in several end-use industries leading to more product development which will positively impact the silver nanoparticles market. Government policies to promote LED lights to enhance energy efficiency will stimulate the industry growth. Government initiatives towards increasing usage of renewable energy particularly solar will drive the product demand. Fluctuating raw material prices is a significant factor limiting the industry growth. Comparatively higher costs along with high initial investment cost pertaining to equipment can hinder the silver nanoparticles market share. Silver nanoparticles market from healthcare & lifesciences sector will be valued over USD 1 billion by 2024. Wound dressings, antibacterial creams, x-ray films, endotracheal tubes, catheters, and other medical devices are among the key applications. Emergence of antibiotic coating in medical equipment particularly for endotracheal tubes and catheters is propelling product demand. Enhanced accuracy along with cost effectiveness have stimulated product penetration in x-ray films. Food & beverage packaging applications in silver nanoparticle market will witness over 12% CAGR up to 2024. Growing consumer awareness along with increasing food transportation will stimulate the growth in this segment. Increasing packaged food sales due to changing lifestyles and increased consumer affordability are resulting into demand for more sustainable packaging. Combatting bacteria and maintaining long lasting food freshness makes the material more lucrative in food packaging industry. Textiles accounted for over 25% of the overall demand in 2017. UV protection, resistance to fungi, and water repellence are the key properties driving the product growth. In textile industry, product is gaining adoption as a floor covering, upholstery fabrics, car seats, silk fabrics, linen, geotextiles, and footwear. North America silver nanoparticles market was valued over USD 450 million in 2017 mainly driven by stringent food hygiene regulations. The U.S. government has implemented strict food processing regulations and high food safety standards pertaining to consumer safety. In addition, surging trend towards fast food products and packaged food items encouraging usage of silver nanoparticles for commercial usage. Increasing processing activities in food grains, bakery items and beverages is projected to augment regional industry growth over the forecast period. Asia Pacific silver nanoparticles market will witness growth over 13.5% up to 2024. Changing lifestyle, rising disposable income, and consumer preferences towards processed and packaged foods are the key factors driving industry growth. Electronics industry expansion along with being the hub of manufacturing electronic equipment and parts will drive the regional demand. High investments in health care industry along with emergence of solar panels will support industry expansion. Also, increased product scope & application particularly in liquid crystal displays and conductive inks will stimulate the silver nanoparticles market expansion. Silver nanoparticles market share includes AMES Goldsmith, American Elements, Advanced Nano Products, Applied Nanotech, Cima Nanotech, Nanocs, and Cline Scientific. The global industry share is highly fragmented with presence of both well-established and regional players. Other notable players include Meliorum Technologies, Nanocs, nanoComposix, BASF, Meliorum Technologies, BBI Solutions, and NanoHorizons. Strategic R&D investments for increasing the product adoptability and mergers & acquisitions to gain a larger market share are among major strategies observed in the silver nanoparticles market. For instance, Ames Goldsmith acquired Colonial Metals, a supplier of chemicals made from precious metals. Acquisition and partnerships will increase the company’s reach and expand product portfolio. BASF acquired Seashell’s nanowire technology to expand their product portfolio, hence enhancing consumer reach. Various applications of silver include industrial, jewellery, and coins & bars. 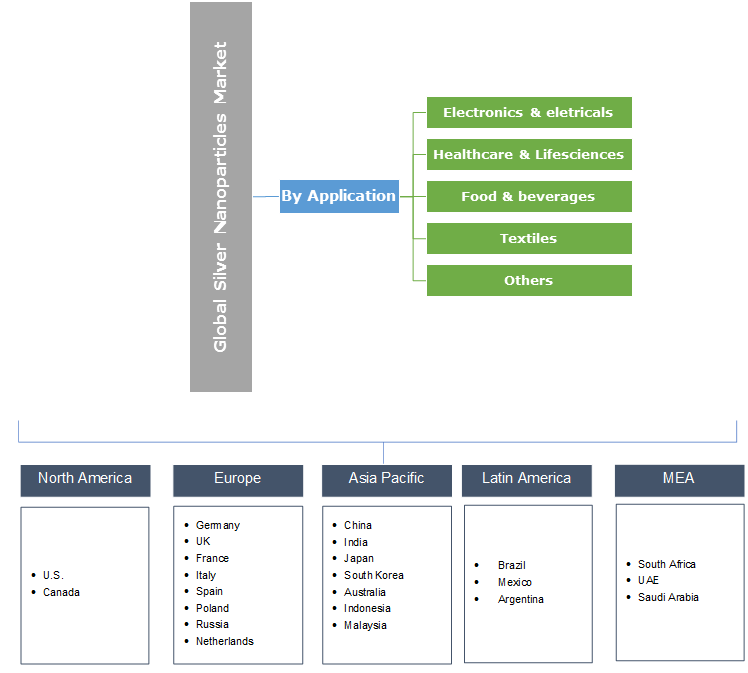 Its industrial applications are among the dominating segments catering the silver nanoparticle market. Technological advancements and increasing product adoption will fuel the industry demand. Growing food packaging industry and government regulations on food quality will support the market growth. Nanoparticles have extensive and diverse applications in industries including food & feed, cosmetics, optics, healthcare, optics, chemical industries, textiles, light emitters, electronics, nonlinear optical gadgets, mechanics and photograph electrochemical applications. Rising product portfolio with strategic R&D investments will positively influence the industry growth. Diverse properties of raw materials and high industrial applicability will have a positive effect in increasing product scope and applicability.